In the development of this module we were blown away by how much there is to explore. Each tank has a totally different set of characteristics, and there were many unexpected surprises when feeding it a wide variety of sound sources. One of the most interesting results was how a slow attack saw waveform from a Dixie almost sounds like a realistic cello! Parametric EQ with controls for frequency, Q, and gain. Feedback path with virtual tube circuitry. Redesigned limiter circuit in feedback path to prevent high gain feedback from clipping the output. Selector switch to choose between three different connected tanks (one on the front and two on the back). 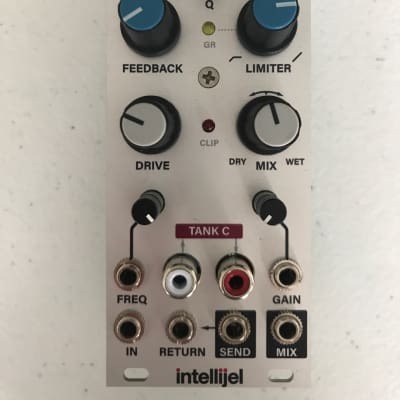 Improved drive input with large gain (can overdrive the tank inputs). 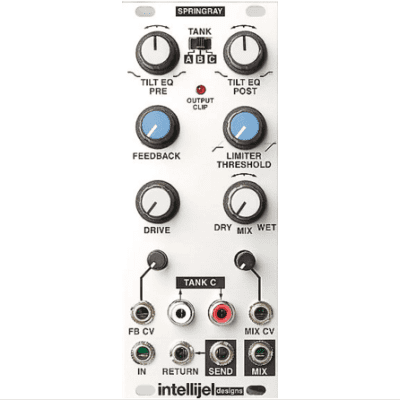 External processors can be inserted into the feedback path via the SEND/RETURN normalled inputs. Three different sizes of Accutronic tanks are available.